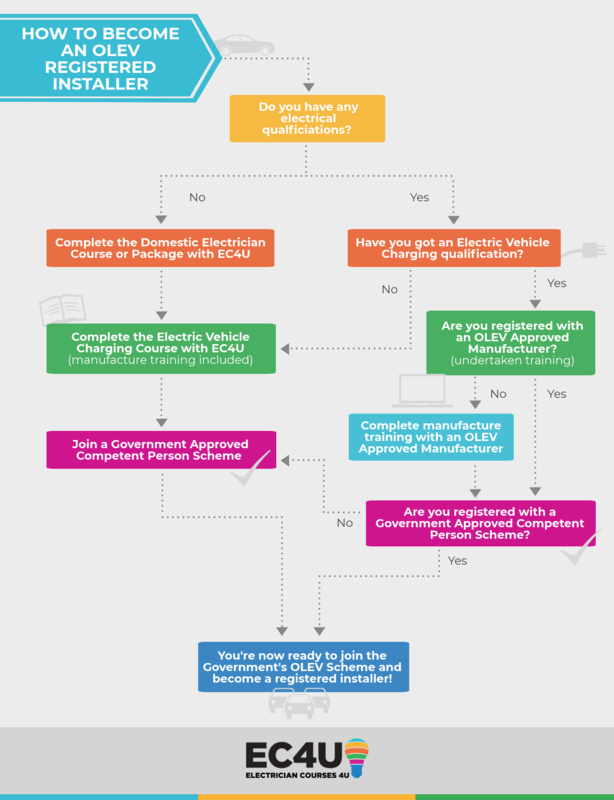 If you are an installer or homeowner looking to have an electric vehicle charging point installed in a domestic premises, you may be eligible for an OLEV grant. These grants offer you the chance to claim money back on installations, however, there is a criteria in order to claim, for example, installers must be registered with OLEV. OLEV stands for the Office of Low Emission Vehicles. This is a part of the government that is there to support the market for ultra-low emission vehicles. OLEV is part of the Department for Transport and part of the department for Business, Energy & Industrial Strategy. OLEV offer two grant schemes, one for home-based installations and one for workplace installations. We are going to focus on the home-based installation scheme which is known as the Electric Vehicle Homecharge Scheme (EVHS). In short form what this scheme essentially allows you to do is claim 75% of the cost of the installation and materials of the home charging point up to £500 for your customer. Once this has all been submitted and verified you will be added to the list of OLEV approved installers and be eligible to claim the grant on your customers behalf. For a full list of eligibility guidelines please visit the government website.